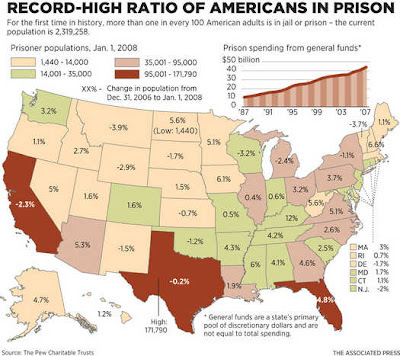 America has 2.3 million people in prison — more than any other country. More than one in 100 adults are in jail. No society in history has imprisoned more of its citizens. 1 in 9 black men aged between 20 and 34 is behind bars. There are more 17-year-old black American males in jail than in college. Ameriacan has five percent of the world’s population but 25% of its prisoners. And prison labour is now a huge industry, producing an enormous range of goods, not least for the US military. It is in effect a revival of the slave trade. Britain can’t compete but is no slouch either, locking up more of its population — 148 per 100,000 — than any other European country, and more than China, India or Turkey.